Your smile says a lot about you. mySmile solutions at the DH Smile Center set us apart from other offices in the provision of aesthetic dentistry. 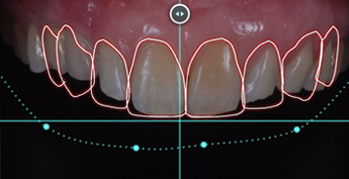 Our process starts with a Digital Smile Design of your teeth. We use photography to explore your desires and the shapes, colours and contours of teeth that best reflect your personality. Our design is communicated to our team of technicians and ceramists who can either create a waxup of your smile or 3D mockup. From the digitally designed wax-up and 3D mockup we make a prototype to test out our proposed design. This allows you to see the teeth before we ever touch them. It also gives us an indication of how well we can integrate the teeth to your smile. We then sit down and select materials and techniques that can best be used for the desired results. Guided preparation of the teeth is then made to make space for the ceramic materials, mySmile solutions focus on minimizing tooth reduction while maximizing aesthetics. For large smile designs a period known as the Test-Drive will follow that will enable you to walk and talk and live with your prototyped teeth. Once these are approved or ceramists will begin the fabrication of the precision designed restorations. We use porcelain veneers, porcelain crowns and composite resin materials to reshape, re-colour and re-engineer your smile. Our process is such that we want to make sure you are getting the smile of your dreams, mySmile.